About the Book Don’t miss this unforgettable debut novel, told in two timelines, about smart fashion, pursuing your dreams, and loving yourself! It's all about fashion for Cookie Vonn and she dreams of one day being a famous designer. She has the talent and drive to make it happen but their is just one thing that stands in her way, she isn't the ideal of what the fashion would consider skinny. She's plus size and determined to change the way the world sees bigger women. I chose this book because the main character is fat and I can essentially relate to that. I wanted to see her make it big in the fashion world but it didn't really to seem to be about fashion. She's teenage girl very aware of her body and what makes it look good but she doesn't see that when she looks in the mirror. She's tired of living in the shadow of her model mother. 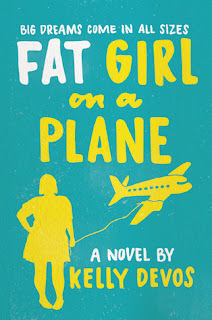 She's in love with her best friend but doesn't think he wants to be with her because of her weight, so she sets out to lose it so he will notice her and believes all her dreams will fall into place. I felt this was an unhealthy way for her to think. If she's not happy fat, she won't be happy thin because she doesn't deal with the real issue that is causing her to be so unhappy. She's seems angry and naive most of the book. I say angry because she's feels like the world is unfair to her because of how she looks. In a sense, I felt bad for her as she battled with her emotions towards a certain mean girl that everyone gave a pass since she having a rough time. That doesn't excuse her being cruel. I also felt that the romance wasn't believable and was unbalanced because of the age factor. It was also gross in a way how it all worked out. The story is set up in a two narrative with Cookie before she lost weight and after. I think I would've liked it more if it was just about her and the fashion world because she was fine the way she was and it seemed she was more unhappy skinny. Overall, this was a quick read but I felt like the ending left much open with Cookie and her future. I think anyone looking for a book about acceptance may like this one.